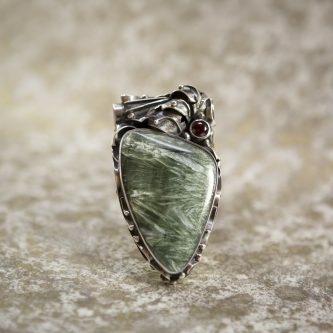 Seraphinite is most loved for its ability to establish connections with the Angelic realm. Its name comes from the inclusions in the stone which resemble feathers of the Seraphim, the angels of the highest order. Seraphinite exists in only one place on earth: Lake Baikal in Siberia, a place believed to be touched by angels. This stone gently clears blockages in your energy field, allowing energy to move freely. It supports healing and inner harmony, while giving hope and guidance. It helps you behave more harmoniously toward others, and to be less emotionally reactive and more joyful. Physically, Seraphinite works with your DNA to release any genetic problems. It is a perfect stone for self-healing.